This set of Power Electronics Test focuses on “Choppers-3”. Vo = Vs/1-duty cycle . . . (for a step-up chopper). Explanation: If it is always in then, Ton = T. Duty cycle = 1. 3. Find the average value of output voltage of a basic step-down chopper, with duty cycle = α and load = R Ω. 4. For the below given circuit, find the output current at the instant of commutation. Explanation: The circuit is that of a step-down chopper. The output current is commutated by the switch(IGBT) at the instant t = Ton. Therefore, output current at the instant of commutation is Vs/R. 5. For a step-down chopper, find the rms value of output voltage. Let α be the duty cycle and Vs be the input voltage. Explanation: [(Ton/T).Vs2]1/2 = √α x Vs.
6. A step down chopper is operated at 240V at duty cycle of 75%. Find the value of RMS switch (IGBT/MOSFET) current. Take R = 10 Ω. Explanation: The switch could be anything, a IGBT, a SCR, a GTO etc. The current through the switch is the same as the current through the load for a step down chopper. I = √α x Vs/R. 7. Find the expression for effective input resistance of a step down chopper. With R load and duty cycle = α. Explanation: Effective input resistance of the chopper circuit = (dc source voltage)/(average source current) = (Vs.R)/(Vs.α) = R/α. 8. A step-up chopper has input voltage of 220 V and output voltage of 660 V. If the conducting time of the IGBT based chopper is 100 μs, compute Toff width of the output voltage pulse. Toff = T – Ton = 150 – 100 = 50 μs. Hence, as duty cycle increases the output voltage increases. Explanation; Vo = Duty cycle x Vs. Hence, output voltage is directly proportional to the duty cycle. 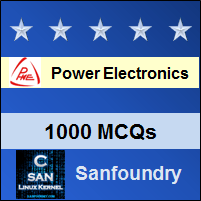 To practice all areas of Power Electronics for various tests, here is complete set of 1000+ Multiple Choice Questions and Answers.